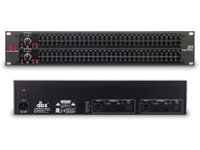 With a lineage extending back to the revered 12 and 20 Series graphic equalizers, the dbx® 231 easily lives up to the dbx reputation at a price point which can find a home in the tightest of budgets. Besides including two 31-band channels of 1/3-octave equalization, the 231 also offers ±6 or ±12 dB boost/cut range; XLR, 20mm faders and ¼" inputs; nonconductive nylon sliders; and an intuitive user interface with comprehensive output and gain reduction metering. As always, the inevitable result of their meticulous attention to detail and top-quality componentry is exceptional sound, performance, and reliability. The 2-Series represents a major step forward in the performance of entry-level graphic equalizers. From its amazing 10 Hz to 50 kHz frequency response, to its 108dB dynamic range, internal torodial transformer, the 2-Series offers out of this world specifications with a down to earth price point. Sure to find a home in the studio, on tour and with installed sound venues, the 2-Series is destined to take its rightful place in the lineage of great dbx® signal processors that are the professional’s choice in signal processing. With such affordable quality there’s no longer any excuse for compromising your sound.